for this crisp fall weekend here on the Farm!!! Apple Butter, Caramel Apples, “Appy Cidy Doh Dohs” and many more flavors of Fall! Adventure into our “KID FRIENDLY” Corn Maze. hunt for the Farm Tractors that are hidden among the Corn Stalks!!! Pop Corn and Broccoli Picking Hayrides!!! This a fun-filled Farm Experience for the whole Family!!! 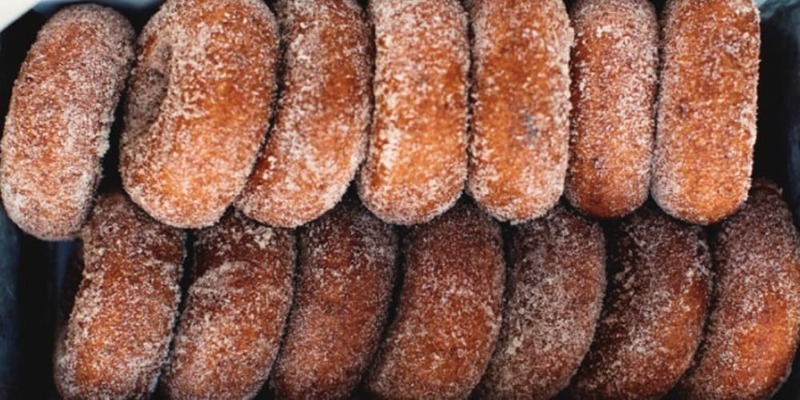 Apple Cider Donuts and so much more!! Chef Scott and his talented Staff are mixing, whipping, baking, slicing and dicing all your Family Fall Favorites! our Yummy Pumpkin Roll there’s something for everyone!! Hall Farm in Springfield Township. From Pumpkin Picking to Popcorn Picking there’s something for everyone here on the Farm!! Please contact Diane @ 609-654-8643 for more info and scheduling. You and your family, friends and neighbors can enjoy the Beauty of the Fall Season while picking our Delicious Crisp Apples, Pumpkins and Gourdes!! Live Music will entertain you along with our “yummy” Farm House Food Tent. Apple Cider Donuts to our Yummy Pumpkin Roll there’s something for everyone!! Columbus Day weekend at the Farm. You know what they say…..
Family Fun here on the Farm!! in time for the Fall Harvest on Saturday 10/11!!! We are planning and preparing for a WONDERFUL Fun Family Farm Experience for Everyone!!! We’ll “kick-off” the Fall Picking with 6 varieties of Apples. are ripe and ready for picking. until 5pm Saturday, Sunday, and Monday Columbus Day!! CLICK HERE for our daily schedule. Apple Bread, Pumpkin Muffins and so much more! This venue will also be offered on Columbus Day, Monday 10/13!! 2691 Monmouth Road, Jobstown NJ!! Hayrides run weekdays 11am-5pm(on the hour) . Pony ride for the kids every weekend!!! Pics and visits with all of your favorite Characters. We will be offering a limited variety of goodies from our Medford location!! The wait is finally over…..
out at 10am today, Friday 9/12! Farm Market where we’ll making Apple Cider Donuts! Apple Butter and Pumpkin Butter. Hot Dogs, Cold Drinks and Chips. Saturday and Sunday as well!! We invite WHYY members to receive FREE Admission to our Discovery Barnyard and a FREE Hayride! Not a WHYY member? You can become one tomorrow from 10am-12pm! Johnson’s Corner Farm in Medford!! meet and greet your children!!! Super Fun Time here on the Farm!!! FALL HARVEST here on the FARM!! Pulled Pork, Hot Dogs, Nachos and Cheese, Tator Tots, and much more!! family on a Fun, Kid-Friendly Adventure!!! IMPORTS will be rolling onto the Farm!! you’ll always know what’s going on at Johnson’s Corner Farm!! In honor of Johnny Appleseed Day…. Hayrides run weekdays 11-5pm on the hour. Columbus Day Hayrides run 10-5pm-continuously. Johnny’s real name was John Chapman. His purpose for planting Apple seeds was to ensure that no one would ever go hungry. He carefully selected areas to plant the seeds and used fallen trees, logs and vines to fence the apple seeds in. He lived on food provided by nature and never killed animals. When he received money for selling his apple trees he would bury the cash instead of putting it in the bank. Now taking RESERVATIONS for ALL Fall Farm Tours! Johnson’s Corner Farm Field Trips. PUMPKIN and APPLE PICKING are just around the corner!!!!! are just around the corner!!!!! answer all your questions and book your tour!! Think outside the “Apple/Pumpkin” box and experience the farm in November!! and digging up “Sweet Potatoes”! includes a CORN SHELLING/APPLE CIDER PRESSING demo. This is truly a One of Kind tour!! The month of December ushers in “Cookie Decorating Kits” A low key activity where we provide all the fixings for delicious, creative cookies to enjoy here or take home.LIVE reindeer in December so don’t miss this great Holiday experience. Our Birthday party packages are fun for the whole family. From toddlers to grandparents, everyone loves the farm. Check this link for more info. your family this weekend, stop out to the farm! APPLE PICKING begins on or about September 9th!! Thanks for being a Johnson’s customer. We will see you at the farm. Please foward this to any teacher or group leader that might be interested. The “JERSEY” HARVEST is plentiful!!!! LOCAL Produce is at the “PEAK” of the season!!! All of this HOT weather has produced an abundance of sweet delicious; CANTALOUPES, JOHNSON’S SWEET CORN, TOMATOES, PEACHES, BLUEBERRIES, EGGPLANT, WATERMELONS & ZUCCHINI!!! Our Farm Market is full of ALL these LOCAL Favorites plus a LARGE variety of other produce as well. FRIDAY July 12th from 5-9pm!!! Kick off the weekend w/a stroll down memory lane admiring over 50 CLASSIC CARS on display!! Pulled Pork, BBQ Ribs & Chicken, Burgers/Dogs, Grilled Corn and much more!! Kids pay the “temperature” for Hot Dogs and Small Soft Serve Ice Cream! Discovery Barnyard & Animal Farm will be offered @ 1/2 price! Splish Splash I was taking a “laugh”…beat the shore traffic and spend the evening here on the farm. Cool off in our SPLASH PAD while enjoying 1/2 price admission to our Discovery Barnyard & Animal Farm. Make sure you bring the towels! Chef Scott and his talented staff have been creating AMAZING NEW “DINNERS TO GO” They will make their debut today in our “DINNERS TO GO” Case located at our Service Counter. -layers of yummy NJ Tomatoes, Sauteed Spinach along w/a balsamic reduction. as ALL your familiar favorites!! Bring home a delicious dinner for you and your family! Our “ICED” SWEET CORN has arrived!! from our fields to you table! are ripe & ready for picking!! Take a leisurely HAYRIDE across our farm and experience “hands on farming”. Blueberries are a “SUPER” food loaded w/vitamins, minerals and antioxidants! We like to call them “nature’s” candy!! Pick a pint or two and enjoy JERSEY FRESH at its BEST!! SPEND the DAY here on the FARM…. So bring the family, friends and neighbors and “kick” the weekend off right…..here on the FARM!! Kids pay the “temperature” for Hot Dogs and Small Soft Serve Ice Cream! Discovery Barnyard & Animal Farm will be offered @ 1/2 price! Splish Splash I was taking a “laugh”…beat the shore traffic and spend the evening here on the farm. Cool off in our SPLASH PAD while enjoying 1/2 price admission to our Discovery Barnyard & Animal Farm. Make sure you bring the towels!! and so easy to make…. 2.In a medium bowl, stir together 1 cup sugar, 3 cups flour, and baking powder. Mix in salt and cinnamon. Use a fork to blend in butter and egg. Dough should be crumbly. Pat half of dough into the prepared pan. Jersey Zucchini, Yellow Squash and Cucumbers. Bring you Hayride Ticket into the Farm Market and get these delicious Jersey products for 1/2 Price.